Trump Hails Confederate General At Ohio Rally [VIDEO] - Joe.My.God. “So Robert E. Lee was a great general and Abraham Lincoln developed a phobia, he couldn’t beat Robert E. Lee,” Trump told supporters at a rally in Lebanon, Ohio, the latest place he’s visited to boost GOP candidates before the midterm elections. 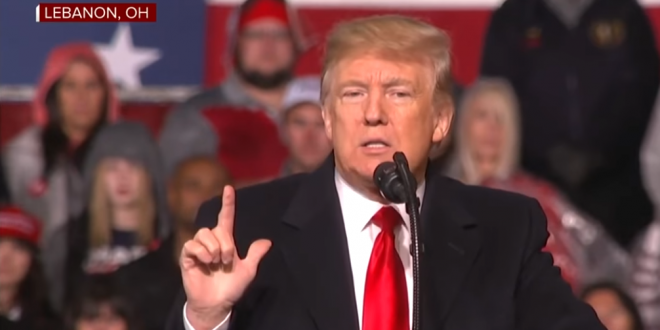 “He was going crazy … but Robert E. Lee was winning battle after battle after battle and Abraham Lincoln came home and he said ‘I can’t beat Robert E. Lee.” Trump added that the frustrated Lincoln was forced to turn to Grant to finally deliver a victory for the Union and to end the Civil War. Trump went on to describe how “incredible” Union commander and Ohio native Ulysses S. Grant went on to defeat Lee, and referenced Grant’s heavy drinking. In recent years memorials to Lee and other Confederate leaders have become a focus of protests and fierce debate, with Confederate monuments removed from towns and cities across the U.S. following the 2015 Charleston church shooting by white supremacist Dylann Roof, who in pictures had posed with a Confederate flag. Trump regularly discusses alcohol in personal terms. The issue most recently come up during the confirmation of Justice Brett Kavanaugh, who faced allegations of not only sexual assault but also of drinking to excess in high school and college. Trump said he was surprised that Kavanaugh repeatedly noted how much he liked beer as a student when he testified before the Senate Judiciary Committee. Robert E. Lee is still trending at #3 on Twitter this morning.